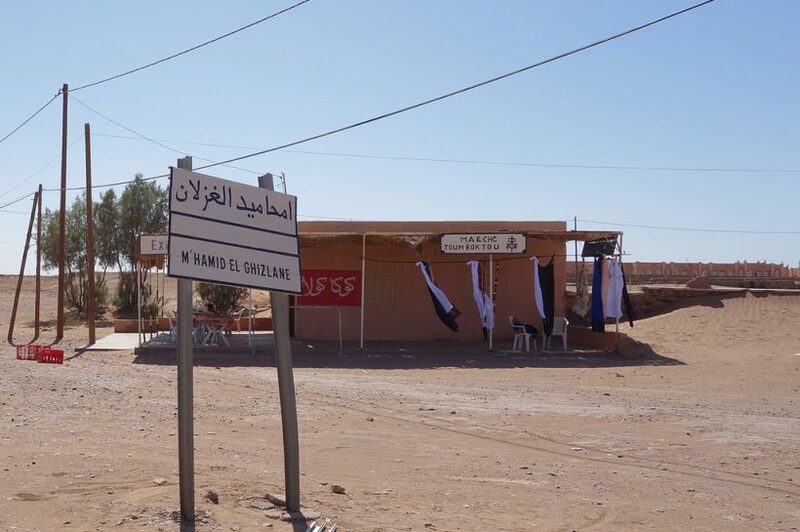 Visit M’Hamid El Ghizlane which is a village in Zagora region of Morocco, 98 km after Zagora, one of the two places in Morocco where Sahara begins, another is Merzouga. 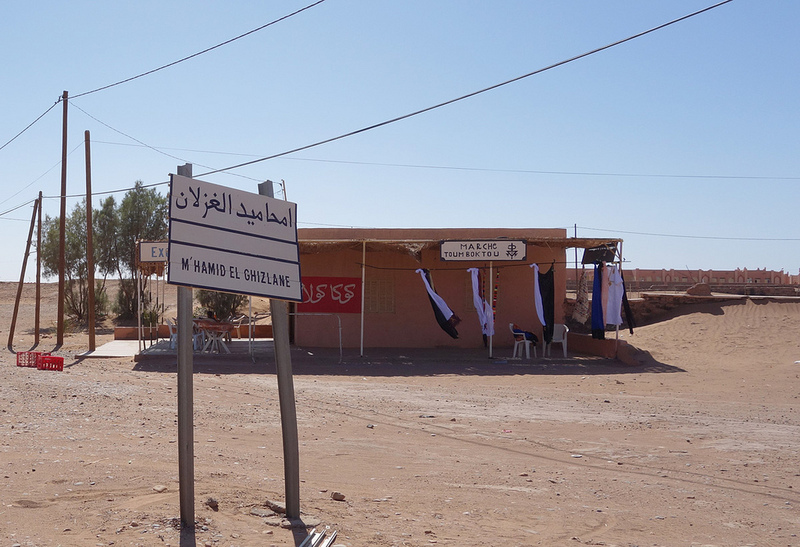 M’Hamid is a small town that is easily explored by foot. 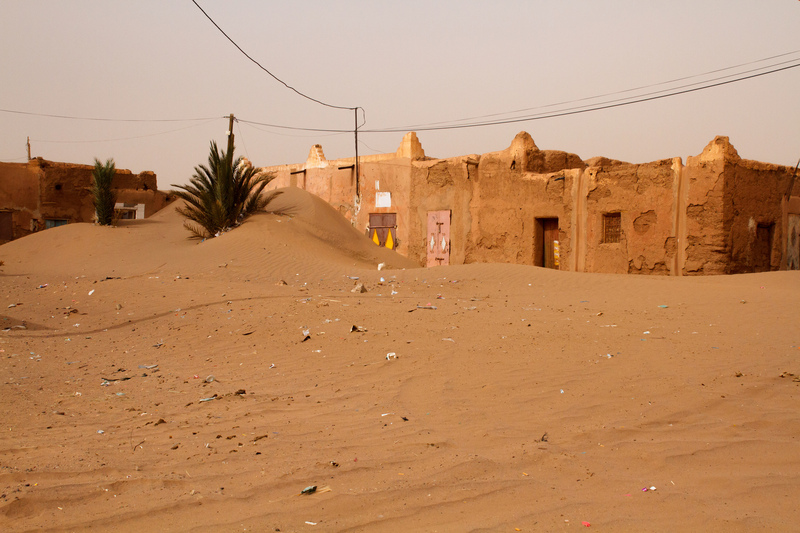 The village gets fewer visitors than Merzouga and is arguably more “authentic.” It is about 7-8 hours by car from Marrakech and 5 hours from Ourzazate. 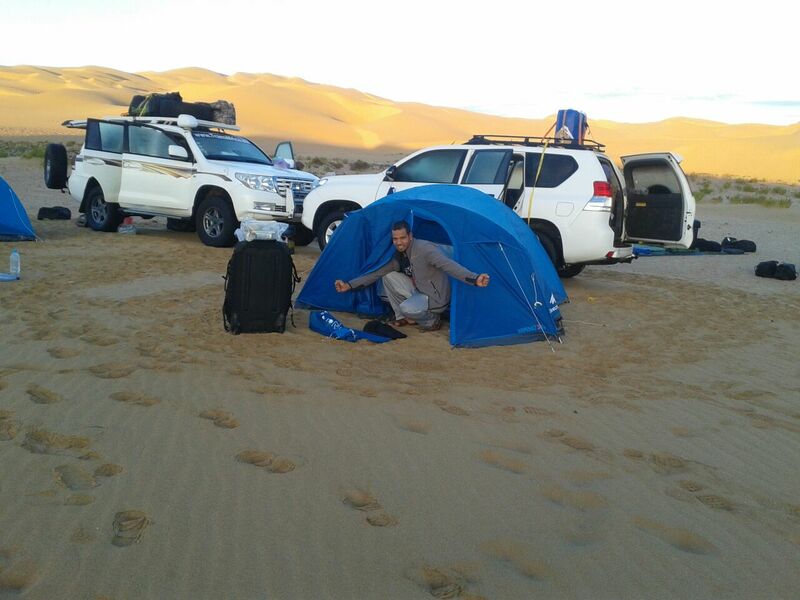 It is “The end of the road” or ” The door to Sahara” (the last point of The route national N°9), after it is only sand of Sahara, shepherds and caravan trails. Across the bridge over the river Draa (which is often dry these days as a result of the barrage at Ouarzazate), take the right and follow the road around the curve. 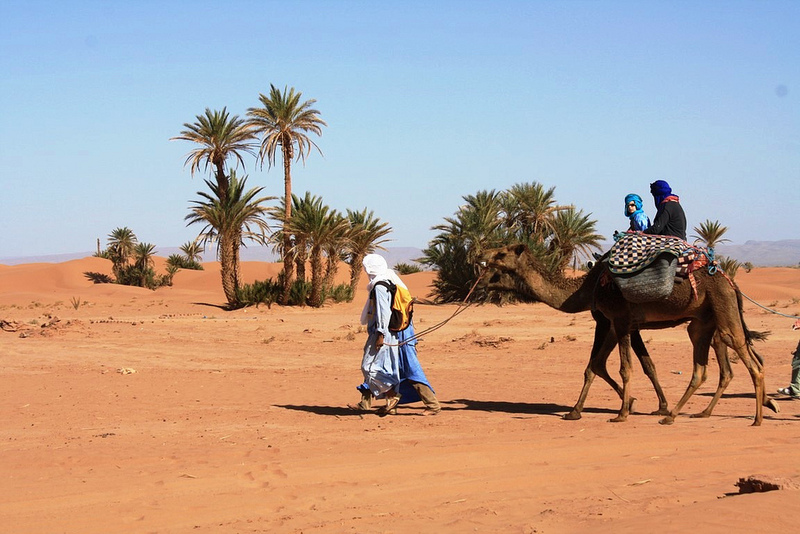 You will pass the Auberge de Palmerai on your left, you are heading towards the Kasbah which is still inhabited by families, and towards Oulad Youssef village. This is a lovely area to explore by foot as it is covered with palm trees and the terrain is quite gentle. 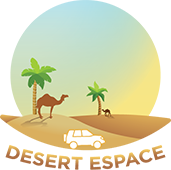 There is a paved road to make sure you don’t get lost, and also the villages ensures that there is a relatively dense population around, who are very friendly and will help you find your way back to the road. Or a passing motorbike may give you a lift back to M’Hamid centre. You can spend 2-3 hours wandering in this immediate oasis vicinity of M”Hamid, getting a good feel for the vegetation, the home- and farm-steads, and the people. 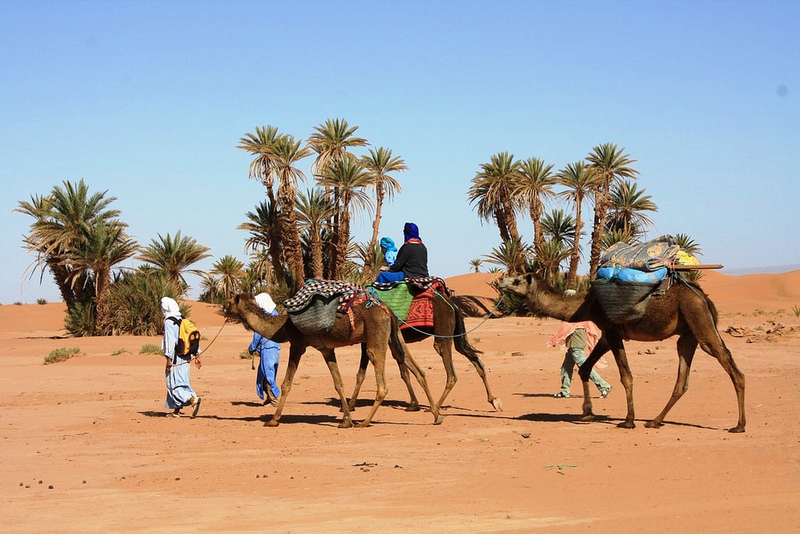 You can go for a Camel ride, note that these dunes may not be as ‘fairytale’ as Erg Chigaga which are about 60 km from the village, but if you are not interested or do not have the budget to hire a 4×4, this is a good option to get a feel for riding a camel and for the sand dunes. 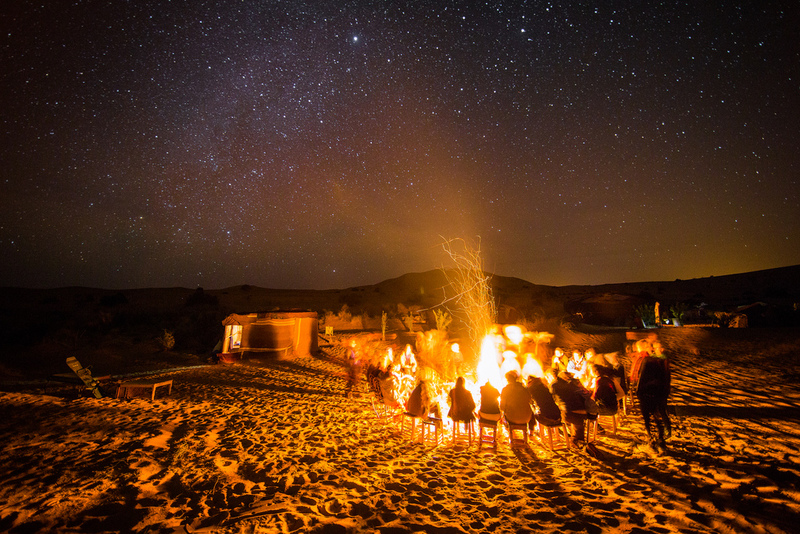 The main thing people come to M’Hamid for is trips to the desert. For questions about the possibilities for tours etc. please contact us via E-mail. There are many Tour include a Visit M’Hamid El Ghizlane, more than we can organize a Trip as you want.